This is a sponsored post written by me on behalf of Andre Champagne. All opinions are 100% mine. 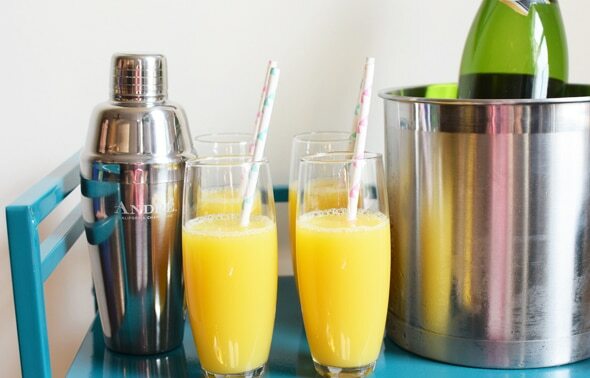 If you’re hosting a bridal shower brunch it’s an absolute must that you have mimosas! Mimosas are one of my favorite drinks because it one of the few cocktails that are acceptable to have before 11 a.m.! Plus you just feel fancy sipping on a yummy mimosas with your besties while all looking your best! 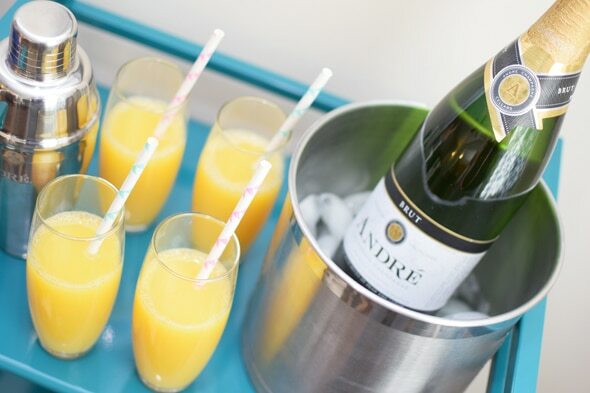 Mimosa bars are great because they are fun, easy, and can really break the ice among guests at the event. There are many ways to style a mimosa bar but I wanted to try something a little different this time. I just got the best bar cart and was dying to use it! 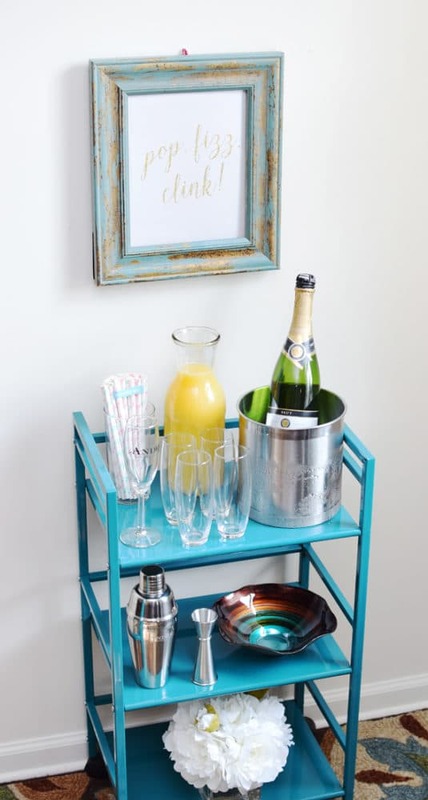 If you’re hosting a small group for a bridal shower at home, the bar cart is the perfect thing to use when setting up a mimosa station for guests. 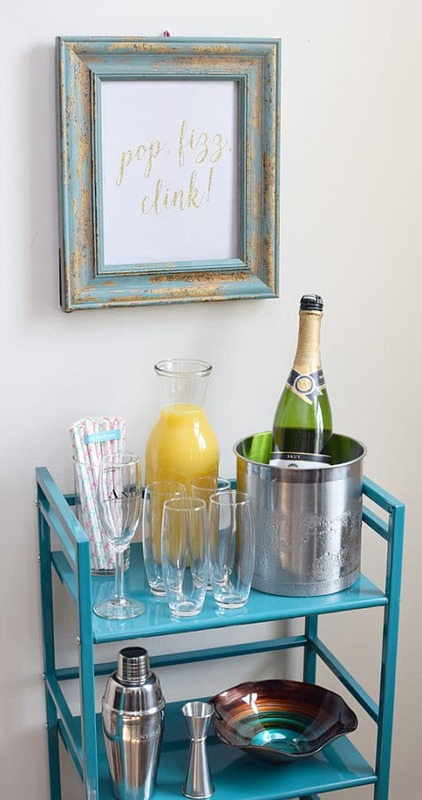 So now we’re going to show you how to style a Mimosa Bar Cart for a bridal shower. 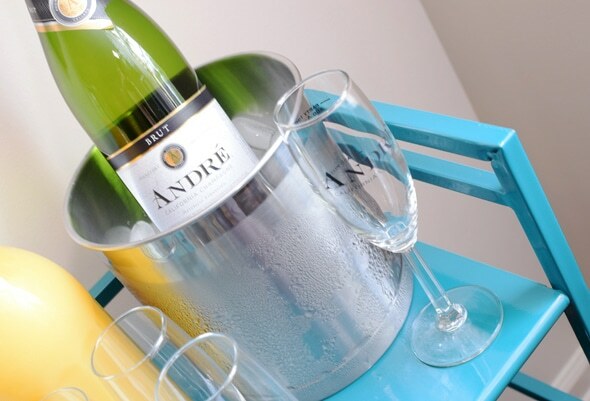 First, you can’t set up your mimosa bar cart without champagne, right?! Andre Champagne is the ultimate luxury without the big price tag and can turn any ordinary party into an epic celebration! Make your bridal shower epic with Andre Champagne and their selection of nine different California champagnes and sparkling wines. 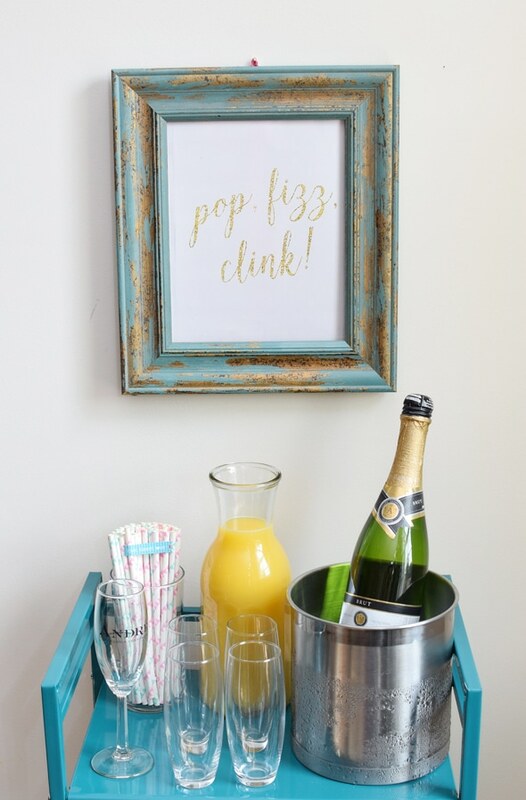 Next, you need a fun bubbly sign or banner to hang above your mimosa station. 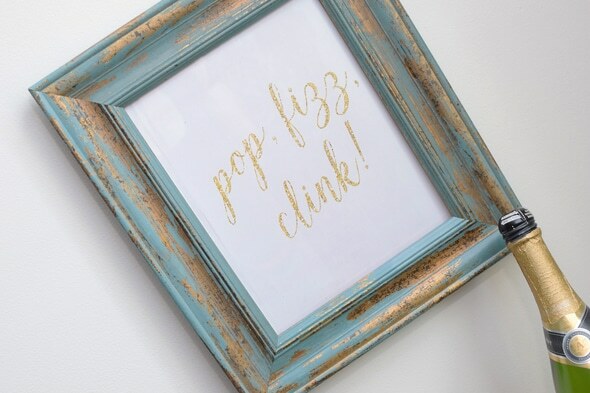 Pop, fizz, click just seemed like the perfect fit for this epic bridal shower brunch! When making your traditional mimosa, remember is one juice to one part Andre Champagne. It’s really up to you and your personal preference on what you would like to include on your mimosa bar cart. Andre Champagne is perfect for all occasions and can be with you on your entire wedding journey. From the moment he proposes, to celebrate at your engagement party, to your bridal shower and bachelorette parties, to your wedding and honeymoon! For your next gathering, make it #EpicWithAndre. 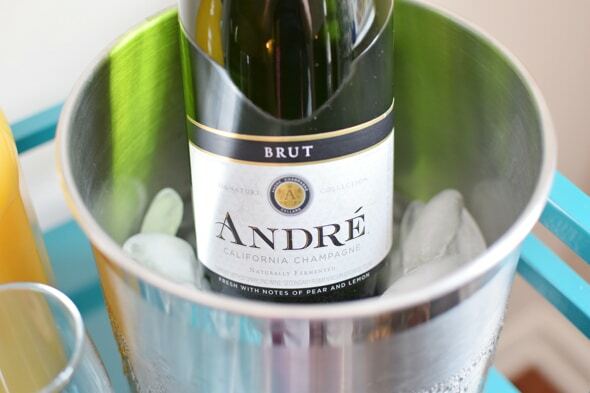 How did Andre Brut make your ordinary, extraordinary?! Share your epic stories here in the comments below! Too cute! I love the printable and the teal color of your table. Darling! Perfection! The scale of the bar cart is absolutely perfect for the mimosa fixings! How fun! I love this!! 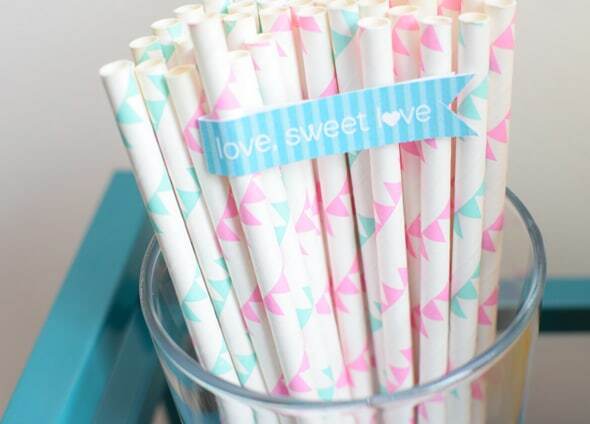 Super cute and so fun! Love this idea!